We have received 37 reviews of Me and Mister P . You can add a review or scroll down to read reviews. To send in your review of Me and Mister P , please fill in the info below and click the button labelled Send Review Now. Reviews will be checked by our team before they appear on the website. Your last name will not appear on the site, but we need to know who you are in case you win a prize! Maria Farrer lives in a house in the middle of a field in Somerset with her husband, four daughters and a black Labrador. She used to live on a small farm in New Zealand with a flock of sheep, a herd of cows, two badly-behaved pigs and a budgie that sat on her head while she wrote. 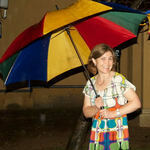 She trained as a speech therapist and teacher and later she completed an MA in Writing for Young People. Maria loves language and enjoys reading and writing books for children of all ages. Maria loves the outdoors, so when she is not writing she loves to walk, run, cycle, climb, and ski. She has a passion for hills and mountains. PREPARE TO MEET THE WORLD'S MOST HELPFUL(ISH) POLAR BEAR. Arthur is understandably surprised when Mr P turns up at his door expecting to stay: Mr P is a huge polar bear with small black eyes, and long sharp teeth. Fortunately for Arthur and his family Mr P is polite and friendly and his stay as a guest brings about all sorts of changes for the better. Having to look after him makes Arthur see things differently while Mr P’s uncritical, tolerant presence is a calming influence on Arthur’s brother Liam, who finds it difficult to act the way others do. This is all mixed up in a funny, often surreal story about the challenges of managing a polar bear at school, and with a sub-plot concerning a tense football match. Fact 1: Me and Mister P has also been nominated for the 2018 Carnegie Medal (a prestigious national children’s book award). Fact 2: The next book in the Mister P series is called Ruby’s Star and will be published in June 2018. Fact 3:Maria likes to ride her bike to the top of steep hills so she can hurtle back down again as fast as possible. She also loves mountains, snow and adventure and one day she dreams of going to the Arctic to see polar bears in the wild. Harrison gave Me and Mister P 5 out of 5 and now plans to read Amelia Fang and the Barbaric Ball by Laura Ellen Anderson. This book is such a fun book where a polar bear comes to stay at a boys house but at the end he sadly has to leave ??. Lily-Rose gave Me and Mister P 5 out of 5 and now plans to read Amelia Fang and the Barbaric Ball by Laura Ellen Anderson. Zac gave Me and Mister P 5 out of 5 and now plans to read Amelia Fang and the Barbaric Ball by Laura Ellen Anderson. It was weird because there was a polar bear on his door step. My favourite charter was the polar bear. samantha gave Me and Mister P 5 out of 5 and now plans to read Attack of the Alien Dung! by Gareth P Jones. I liked if it said louder it went from a small letter to a big capital letter. My favorite charter was Mr P.
Millie gave Me and Mister P 5 out of 5 and now plans to read Amelia Fang and the Barbaric Ball by Laura Ellen Anderson. Me and mister p is a great and interesting book to read because it is kind to help and animal and really awesome how a real polar was a mascot and how kind and helpful mister p is i love the book i couldn't take my eyes off the book it is a really awesome book to read its the best book ever to read i love the book so much i cant wait to read Ruby star. Isabella gave Me and Mister P 5 out of 5 and now plans to read Amelia Fang and the Barbaric Ball by Laura Ellen Anderson. My favorite part of the book is when Mister p wins the silly's football photo comp. I'd definitely recommend this book to someone who is under 14 because it is a bit of a kiddish book. Kaira gave Me and Mister P 5 out of 5 and now plans to read The Incredible Dadventure by Dave Lowe. It's a really good book its funny when they win the funniest football photo,learns how to play football and sad when Mister P leaves. I would definitely recommend this book to anyone under fourteen . Seth gave Me and Mister P 5 out of 5 and now plans to read The Incredible Dadventure by Dave Lowe. This was an hilarious book to read as it was full of surprises and laughter. I liked it when Mister P tried to get in the car!!! I would recommend this book to everyone. Lily gave Me and Mister P 5 out of 5 and now plans to read Greta Zargo and the Death Robots from Outer Space by A F Harrold. I like the bit where Mister P learns how to play football and wins the funniest photo comp. Savannah gave Me and Mister P 4 out of 5 and now plans to read Greta Zargo and the Death Robots from Outer Space by A F Harrold. I absolutely love this extraordinary and imaginative book is extremely funny and has alot of humour to it. I cannot expect better from this amazing book.Mr P is very kind and helpful and would be a delight to have him in our real world to go round to people or families that maybe needs some extra help or need some comedian comedy in their life. I think that Liam just needs a bit of extra attention from his mum and dad and that is what Mr P was trying to help with.I think Mr p would help mum and dad out alot as he is keeping the boy's busy and occupied with Mr p.But most of all I think he made the family happy. Ben gave Me and Mister P 5 out of 5 and now plans to read Amelia Fang and the Barbaric Ball by Laura Ellen Anderson. Jacob gave Me and Mister P 5 out of 5 and now plans to read Amelia Fang and the Barbaric Ball by Laura Ellen Anderson. Francesca gave Me and Mister P 4 out of 5 and now plans to read Amelia Fang and the Barbaric Ball by Laura Ellen Anderson. I love Me and Mister P because Mister P is a funny character,he is scared of his own photo and It is weird how Mister P is delighted to stay with Arthur but in the End he has to leave to go to a new place to stay.Who was the person who taught Mister P to write and who were his parents?Where are Arthur's parents from?#Bring back Mister P from year 4 in Whinmoor St pauls Church of England Primary School!!!!!!!!!!!!!!!!!!!!!!!!!!!!!!!! Elera gave Me and Mister P 5 out of 5 and now plans to read Amelia Fang and the Barbaric Ball by Laura Ellen Anderson. I really enjoyed this book is very exiting but sad in some parts that’s why I like it . The author takes you on a ride of emotions. Erin gave Me and Mister P 5 out of 5 and now plans to read Attack of the Alien Dung! by Gareth P Jones. I really enjoyed this book it was very fun and sad as well. It has lots of adventure and mystery in it.I rate that another 9 year old child should read this book. Hannah gave Me and Mister P 5 out of 5 and now plans to read Amelia Fang and the Barbaric Ball by Laura Ellen Anderson. I loved this sad but funny book. I loved the creativity of the plot and it was fun to read. My favorite character was Mister P.
Holly gave Me and Mister P 5 out of 5 and now plans to read Greta Zargo and the Death Robots from Outer Space by A F Harrold. This book is lovely book .I wish a polar bear would appear on my doorstep!! Ana Maria gave Me and Mister P 5 out of 5 and now plans to read Knighthood for Beginners by Elys Dolan. This book was really good because you thought the polar bear was going to be bad but then he’s actually really nice. It was funny beacuase Mr P is quite clumsy but he’s quite serious as well. The ending is a bit sad but it’s still a good read. Zak gave Me and Mister P 5 out of 5 and now plans to read Amelia Fang and the Barbaric Ball by Laura Ellen Anderson. 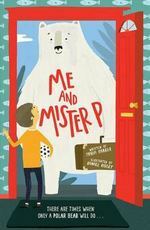 This book was very good.It is s really funny book where a pola bear ends up at someone's door and they have a fun adventure.But unfortunately Mr p has to leave. Isabelle gave Me and Mister P 5 out of 5 and now plans to read Greta Zargo and the Death Robots from Outer Space by A F Harrold. This book is amazing!My favourite character is the polar bear because it is kind.This is special because it tells you about friendship. Riya gave Me and Mister P 5 out of 5 and now plans to read Amelia Fang and the Barbaric Ball by Laura Ellen Anderson. I LIKED THIS BOOK BECAUSE IT HAS A POLAR BEAR IN IT AND I LIKE POLARBEARS. RIAN gave Me and Mister P 5 out of 5 and now plans to read Attack of the Alien Dung! by Gareth P Jones. I enjoyed Me and Mister P because it makes it quite clear that every one is different on the inside as well as on the outside. Take Liam for example, he is autistic but he shouldn't be picked on just because he is autistic. I would give an age range of 6-12. I only rated 4 stars because it could be about something other than football at some points. Madi gave Me and Mister P 4 out of 5 and now plans to read Greta Zargo and the Death Robots from Outer Space by A F Harrold. I liked the book because it is about a polar bear that changed other peoples lives. I liked Mister.P because he is funny. Ethan gave Me and Mister P 5 out of 5 and now plans to read Amelia Fang and the Barbaric Ball by Laura Ellen Anderson. Dylan gave Me and Mister P 5 out of 5 and now plans to read Knighthood for Beginners by Elys Dolan. Ewan gave Me and Mister P 5 out of 5 and now plans to read Knighthood for Beginners by Elys Dolan. This book is excellent because it tells you about a special friendship ad how important friends are and that we need them in our life. I couldn't put this book down. Milan gave Me and Mister P 5 out of 5 and now plans to read Knighthood for Beginners by Elys Dolan. I really liked this book because it reminded me of Nanny McPhee. I would recommend this book to the Queen. Evie gave Me and Mister P 4 out of 5 and now plans to read Amelia Fang and the Barbaric Ball by Laura Ellen Anderson. I really liked Mr P. It was quite sad at the end but I would really rate the book for anybody. Ruby gave Me and Mister P 5 out of 5 and now plans to read Amelia Fang and the Barbaric Ball by Laura Ellen Anderson. I liked Me and Mister P because he acts like a brother to them both and Mister P is very funny. Matilda gave Me and Mister P 5 out of 5 and now plans to read Amelia Fang and the Barbaric Ball by Laura Ellen Anderson. I liked it because Mister P helped Arthur to like his brother more and helped him win the match in football. Dylan gave Me and Mister P 5 out of 5 and now plans to read Amelia Fang and the Barbaric Ball by Laura Ellen Anderson. I think it is an amazing book and lots of people should try it because its funny and,its writing is made in different shapes and sizes to make it stand out more!At first I wasn't shore if I could read a whole book in 2 weeks but this type of book made me want to read more amazing books every single day. Especially this book!My thoughts about this book is that its a funny book and it it is made for people to laugh at, and the polar bear is the funniest part of the book. Maiya gave Me and Mister P 5 out of 5 and now plans to read The Incredible Dadventure by Dave Lowe. The reason I loved Mister P was that it had a lot of humour and the characters were amazing.I did have a question that was never answered - did Liam have autism? It was sad at the end though.He was a very nice polar bear. I gave this book 5 because it had my favourite sport and other reasons. Zaahir gave Me and Mister P 5 out of 5 and now plans to read The Incredible Dadventure by Dave Lowe. I loved this heartwarming book.It was great.I Love adventure books and this was the best so far.Was Liam autistic? It was amazing. Yusuf gave Me and Mister P 5 out of 5 and now plans to read Amelia Fang and the Barbaric Ball by Laura Ellen Anderson. I think this book is absolutely amazing therefore I think people should totally read it.it is sweet when mister p helps Liam find friends. I think Maria Farrer has [even though there are already pictures in the book] definitely created more in my mind and I love those sort of books. Maisy gave Me and Mister P 5 out of 5 and now plans to read The Incredible Dadventure by Dave Lowe. Me & Mr P is a very good book and the pictures are very funny and it is very heart-warming. lars gave Me and Mister P 5 out of 5 and now plans to read The Incredible Dadventure by Dave Lowe.